Lynn Baumgartner of Truckee flies the Jetovator over Lake Tahoe at Carnelian Bay in early July. CARNELIAN BAY, Calif. — Floating chest-deep in Tahoe’s crystal-clear waters with granite boulders visible some 20 feet below, I’m straddling something that looks like it took design cues from a Star Wars speeder bike. Behind me, sitting on a Jet Ski, Lake Tahoe Jetovator owner Michael Culp gives me a 3-2-1 countdown, and a swell of water thrusts me forward and upward into the air. Gripping two handles, I stand and lean forward to balance two water jets in my hands and one between my feet, tipping back and forth until I lose control, splashing down. I tip over backward and to the side on my first few tries, but after only a handful of attempts, I’m gliding feet above Lake Tahoe’s surface, rising and falling, turning and jetting forward. It’s like nothing I’ve done before, and it took only minutes to pick up. 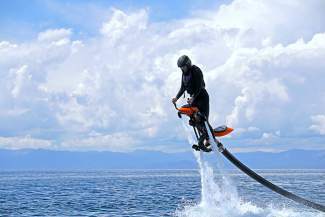 The bike-shaped Jetovator is fed water for its jets by Culp on the Jet Ski via a 30-foot hose, and he controls the bike’s thrust and cuts power if something goes wrong. He motors along behind me as I loop around, keeping the hose slack so it doesn’t knock me off balance. Experienced riders can gain greater altitude tethered to longer hoses, do spins and flips, and even dive under the lake’s surface, but I’m fully immersed in the simple experience of gliding, wrapped in awe as I look down into the water’s depths and up to the towering thunderheads above the far shore. “I like going underwater as long as I can, and trying new tricks like 360s and barrel rolls,” Culp said. Culp, who opened Lake Tahoe Jetovator, based out of Carnelian Bay, this summer as a unique watersports adventure for locals and visitors, has a long history in water sports here on Lake Tahoe. “I have 15 years of experience with boat and Jet Ski operations,” he said. He and his staff offer half-hour-long rides, along with various GoPro-based video options to capture your experience. A choice between the bike and a chair-based jet is available, Culp said. Lake Tahoe Jetovator is located at 5143 North Lake Blvd. in Carnelian Bay. Book a ride or find out more at tahoejetovator.com, or call 530-FLY(359)-8877. Greyson Howard, a former Sierra Sun reporter, is a Truckee-based freelancer writer and photographer.